The Revised Mold Group PL-977 was Dictated by Circumstance! 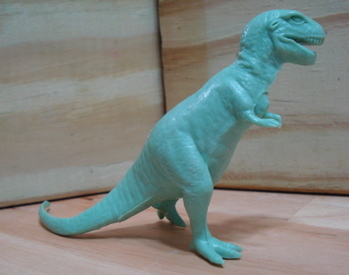 The Revised Mold Group PL-977 Provided More Dinosaurs, Faster, to Meet the Growing Demand. "Sleek T-Rex and the Seven Re-issues." The Revised Mold Group was created due to mass production requirements and the pressures of consumer demand. 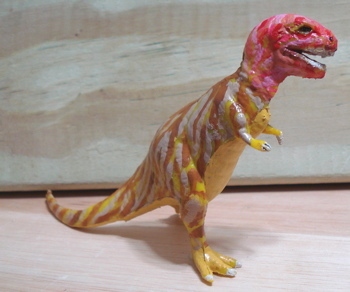 By 1959 Marx had been producing their Prehistoric Playsets for two years, in addition to keeping store bins filled, and found that of their original fourteen figures the Pot Belly T-Rex from the large Mold Group was, in effect, holding up progress. Due to its size and configuration it did not "set" as quickly as the other figures and effectively created a bottleneck in the mass-production process. For better or for worse Marx decided that, in addition to creating an all-new Tyrannosaurus Rex Dinosaur toy (the "Sleek" T-Rex) they would include in this mold group seven re-issues, the Brontosaurus from the large Mold Group, the Dimetrodon and Triceratops from the Small Mold Group and the Allosaurus, Ankylosaurus, Stegosaurus and Trachodon from the the Medium Mold Group. The seven reissues ranged from the nearly indistinguishable from the originals (Brontosaurus, Dimetrodon and Stegosaurus) to minor "improvements" (the Allosaurus and Trachodon both stand straighter) to clearly less than the original ( Ankylosaurus, Triceratops). But the centerpiece and raison d'etre for this large (eight member) mold group was the new "Sleek" T-Rex! 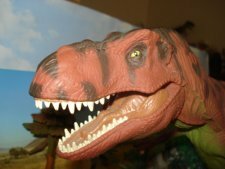 With his open mouth and "dinosaur-action" stance (as well as his understated ferocity) this dinosaur toy added a whole new level of excitement to the entire Marx Dinosaur toys line-up. This new beast in the Marx Toys menagerie was both beautifully balanced and excellently sculpted. A realistic (given paleontological knowledge at the time) Tyrannosaurus Rex in a great "action" pose, powered by the imagination. The revised mold group served multiple roles for the Marx Toys company. 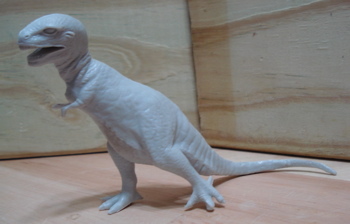 The Sleek T-Rex appeared as a "regular" in all the new playsets, along with the small and medium mold group figures, with the seven extras going into the playsets and bins. The entire eight member revised mold group was also available on plastic bubble cards which are occasionally found today on eBay and in flea markets and at garage sales. 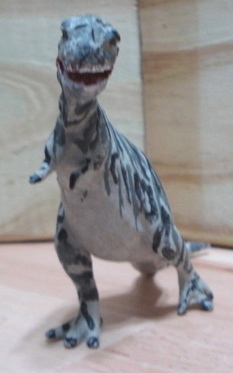 The Revised Mold Group Marked the Marx Dinosaur toys embarkation on their Mass Production Odyssey.